Italian Court Orders Getty Museum To Return Statue To Italy The Getty Museum in Los Angeles says it has no intention of returning the "Statue of a Victorious Youth," a piece of art from ancient Greece discovered off the Italian coast in the 1960s. Ownership of "Statue of a Victorious Youth," a bronze sculpture of ancient Greek origin, is being disputed. An American museum is trying to keep it. Italy's highest court has ruled that the J. Paul Getty Museum in Los Angeles must hand over an ancient Greek statue that was first discovered by Italian fisherman. The Getty Museum argues that since the statue is Greek, not Italian, it "is not and has never been part of Italy's cultural heritage." The museum says it believes the court order violates U.S. and international law, and that it plans to "continue to defend our legal right to the statue." The museum purchased "Statue of a Victorious Youth," a bronze piece of art dated to 300-100 B.C., for nearly $4 million in 1977. The piece of art is also known as the Athlete of Fano, for the Italian town near where it was discovered, or the Lysippos, for the famed sculptor who may have created it. It's one of only a few life-size Greek bronze statues to have survived to the modern day, according to the Getty Museum. The museum says Romans probably took the statue from its original location in 100 B.C. - 100 A.D., and a shipwreck caused the statue to be preserved in the sea. Italy's "Court of Cassation," the supreme court, ruled that the statue was found in Italian waters and improperly smuggled out of the country. Therefore, the court says, it belongs to Italy and must be returned. "It's the last word from Italian justice," prosecutor Silvia Cecchi told the Italian news agency ANSA. The Getty Museum objects, arguing that the statue was discovered in international waters. "Accidental discovery by Italian citizens does not make the statue an Italian object," the museum says. 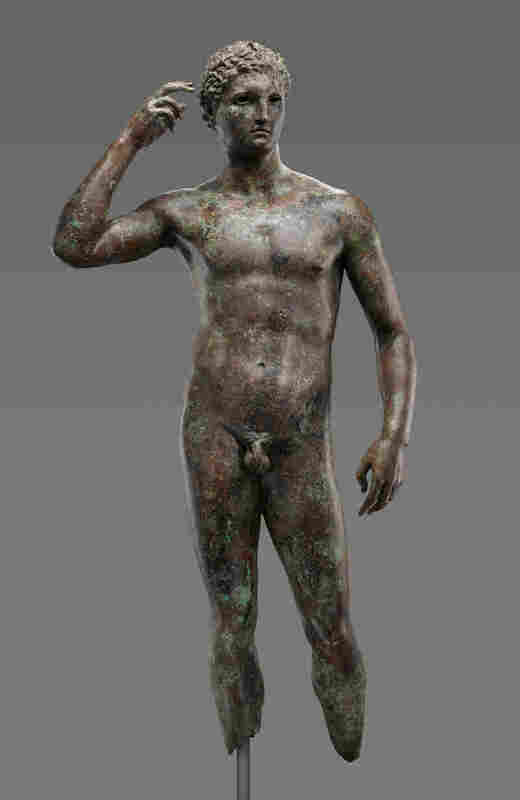 "Found outside the territory of any modern state, and immersed in the sea for two millennia, the Bronze has only a fleeting and incidental connection with Italy." The Getty also emphasizes that in 1968, before the museum purchased the statue, the same Italian high court ruled that there was no evidence that the Italian government had the right to claim the statue. "When the Fano fishermen realized what they had pulled up in their nets, they moved hastily to sell it to a local dealer without informing the Italian authorities, getting the equivalent of around €3,500 for their haul. "The 2,000-year-old artwork, still covered in barnacles from its centuries underwater, was subsequently smuggled in vans and hidden in garages, under a priest's stairs and even, according to some accounts, buried in a cabbage patch to avoid detection. "It's not known how or when it left Italy, but by the early 1970s it had been spotted in Brazil, Britain and finally Germany, where it underwent restoration." The statue was purchased by the J. Paul Getty Trust in 1977, a year after the oil magnate's death. Italy has long disputed the sale, as part of its efforts to protect the nation's art heritage. "In 1969, Italy created the world's first specialized police force to combat art crime. It now numbers 280 investigators who also safeguard artworks in regions struck by floods and earthquakes. The unit also combats antiquities trafficking fueled by conflicts in the Middle East and Afghanistan." This specific disagreement has been brewing for a long time. More than a decade ago — after a bitter dispute with the Italian government — the Getty Museum agreed to return 40 items to Italy, based on evidence that the works of art were looted. Among those works of art was a 7-foot-tall statue of Aphrodite, purchased by the museum for $18 million in 1988, which had been the crown jewel of the museum's antiquities collection. But the museum held firm on the "Victorious Youth." Michael Brand, then-director of the museum, said in a statement in 2006 that he had an "obligation to preserve and protect the Getty Museum's collection," and that Italy had no legal claim on the Youth.